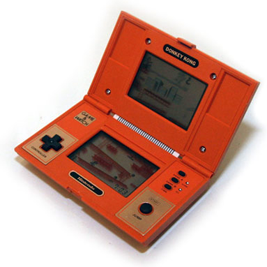 It was Gunpei Yokoi who first came up with the idea of producing LCD games that would fit onto a unit around the size of a pocket calculator. The Game & Watch titles could run on a single watch battery, and not only told the time, but also provided simple-yet-addictive gaming challenges. The Game & Watch games were a runaway success the world over, with many titles selling over a million copies. Sixty Game & Watch games were released over ten years (though some were doubles of earlier games). There were also Game & Watch renditions of Donkey Kong, Mario, and Zelda, each complimenting their NES counterparts. Nowadays the Game & Watch systems are highly collectable, some fetching hundreds of pounds on auction sites. 14 Mar 1983 Mario Bros.
26 Oct 1982 Donkey Kong Jr.
08 Mar 1988 Super Mario Bros.
28 Apr 1983 Donkey Kong Jr.
07 Oct 1983 Donkey Kong Jr.
25 Jun 1986 Super Mario Bros.